Made in USA Chain. 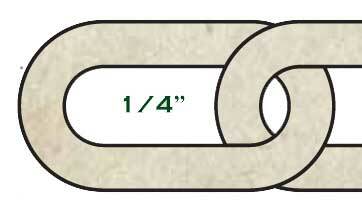 Choose from a variety of Landscape Chain sizes. Landscape Chain Finished with a 3 Stage Process. Finally a high quality Black Polyester Powder coat is applied for a top quality durable finish which far surpasses chain dipped in liquid plastic. Quick Links are now made from marine grade 316 Stainless Steelonly. Higher quantities make UPS regular service uneconomical. Call us at 1 877 422-0242 to arrange LTL or other service. 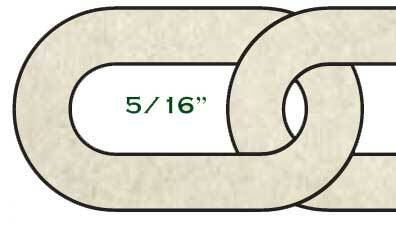 Choose the right Link for the Chain size. Finish is Black Polyester Powder Coat over marine grade 316 Stainless Steel. Choose the right Shackle for the Chain size. Finish is Black Polyester Powder Coat over Hot Dipped Galvanized. Fits 3/8" threaded rod - rod is not included. Hook is open and cannot be closed. Not recommended for commercial use. Use with "D" Shackle to attach to chain. To order chain use the Add to Cart for either US or Canadian destinations - Order Quantity in Feet. Because of its weight the quantity of chain that can be ordered directly through our shopping cart to be shipped via UPS regular service is limited see below for maximums by chain size. Made in USA Chain. Choose from Victorian Spiked Chain or Standard Landscape Chain. Landscape Chain is Finished with a 3 Stage Process. 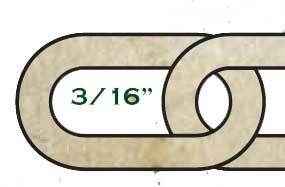 Chain size is wire diameter x inside length of link - 1/4" x 1 3/4"
Forged stainless steel is ideal for wood posts and can be used on granite or masonry by embedding in epoxy. 5" overall length with 4" shaft. Black Powder Coat over Stainless Steel finish only. Because of its weight the quantity of chain that can be ordered directly through our shopping cart to be shipped via UPS regular service is limited by the chain size, see below. 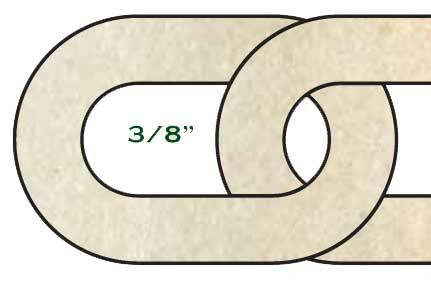 Suitable for 3/16", 1/4" & 5/16" chain only. 2 5/8" long and made from marine grade 316 stainless steel 1/4" diameter stock with Black Polyester Powder Coat..
Packaged with two #8 x 1 1/2" stainless steel screws. Because of its weight the quantity of chain that can be ordered directly through our shopping cart to be shipped via UPS regular service is limited as below according to chain size. If you need more contact us to arrange an alternative shipping method. Choose the right Staple size for the Chain size. Finish is either Hot Dipped Galvanized or Black Polyester Powder Coat over Hot Dipped Galvanized. 316 Marine Grade Stainless Steel with Black Polyester Powder Coat. Choose the right Hook size for the Chain size. Suitable for 1/4", 5/16" & 3/8" chain only. 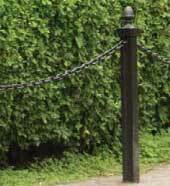 Simple method of attaching chain to wood or granite posts. Supplied with 2" lag screws. 2 5/8" long and made from marine grade 316 stainless steel 1/4" diameter stock with Black Polyester Powder Coat. Quick Links are now made from marine grade 316 Stainless Steel only. Because of its weight the quantity of chain that can be ordered directly through our shopping cart to be shipped via UPS regular service is limited as below. 82ft limit available to order through our shopping cart. Contact us for larger quantities.